SCRATCH SUPPER: CHESTNUT RISOTTO | Jane Lear. Writing on Food and Travel. The smell of nuts, smoke, and char is in the air, and steam rolls across me like incense at High Mass. I could be in northern Italy, where the chestnut vendors shake their hot pans over a wood fire and shout “Caldaaaaaroste!” when they see you coming. His chestnuts are absolutely gorgeous, glossy and fat. And their flavor is wonderful, too. Chestnuts have a rich, round, honeyed sweetness, and these are meaty and moist, with no trace of mealiness or mold. 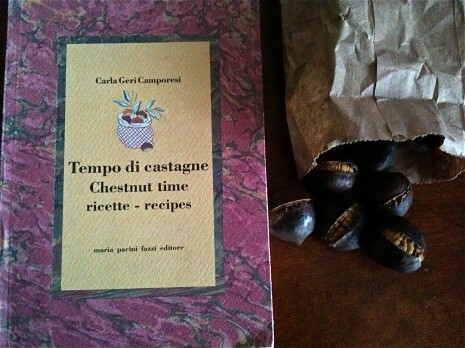 They are genuine new-crop chestnuts, not leftovers from last year’s harvest. They are not from American chestnut trees. The vast majority of those—an estimated four billion trees—succumbed during the mid-20th century to chestnut blight, a fungus that thumbed a ride on imported Asian trees, perhaps, or packing material. This great American tragedy has all but been forgotten, except by many in rural communities—from Maine to Florida, from the North Carolina Piedmont to the Ohio Valley—whose economy (from fenceposts to livestock feed) and ecosystem (from birds to bears) depended upon the chestnut. And it’s remembered, too, by the plant scientists who are breeding blight-resistant trees to repopulate our eastern woodlands. I’ve never eaten a native American chestnut. The freshly roasted chestnuts that are warming my hands are from Italy. And they are really, really good. I buy a few more quarter-pound sacks and swing on home, wanting to share. 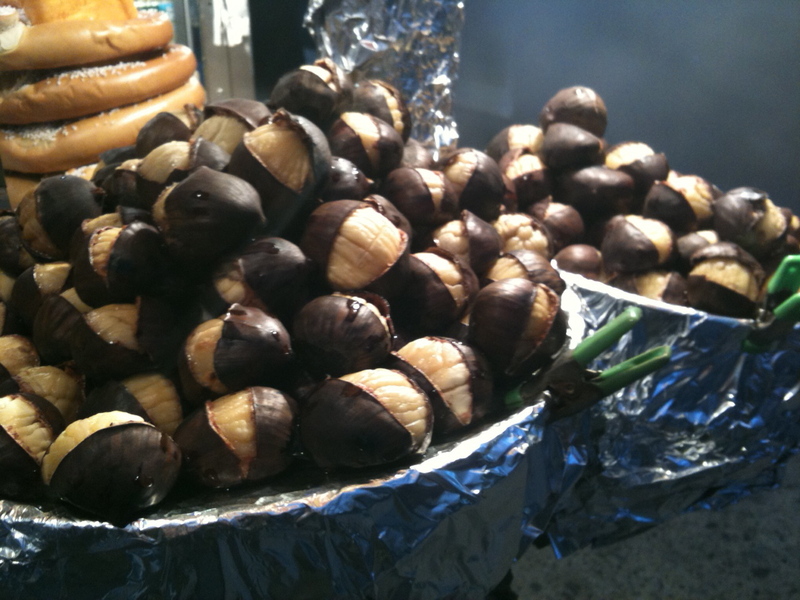 DIGRESSION: Now, most people don’t have access to roasted chestnut vendors, a vanishing breed. And most people don’t have the time, the inclination, or the martyr complex to roast and peel chestnuts at home. That job, not nearly as romantic as it sounds (your fingers burn, bleed, or both), falls squarely in my “Not No, but Hell, No” category. The pre-roasted chestnuts in a vacuum-packed bottle—available almost everywhere this time of year—are excellent, and will do the job nicely. Okay, back to supper. I couldn’t get Italy out of my head. That is where I first ate a chestnut risotto, and bought a beautiful book to mark the occasion. Which, naturally, I could not find when I was ready to cook. Never mind. Risotto is one of those things that sounds luxurious and difficult, but is very straightforward. It can be the basis of many a scratch supper because it’s completely dictated by the contents of your refrigerator (and the plundering you do while running errands). Your jumping-off point is the rice, obviously, but all that’s called for is an Italian medium-grained variety like Arborio, Carnaroli, or Vialone Nano. (Check your supermarket first, before making a trip to an Italian market or fancy-foods shop.) All of them hold their shape and chewy kernel as they virtually suspend themselves in creamy goodness. What could go wrong? A look into the fridge reveals half a large butternut squash, which is easy enough to peel and cut into small chunks. I toss those with olive oil and some salt on a rimmed baking sheet and shove them into the oven to roast. Sweet potatoes would be delicious, too. And if I had any sausage on hand, I might have crumbled that in a pan, cooked it up, and then added it at the last minute. Sam makes quick work of peeling the street-cart chestnuts, although he must have eaten every third one, and cuts them into half crosswise. In terms of the cooking liquid, it’s time to use up the last of the chicken stock that’s in the freezer. If that wasn’t around (in easily thawable amounts), I’d turn to the container of Swanson’s chicken broth lurking in the cupboard; it’s my go-to store-bought broth. While bringing the cooking liquid (about 3½ cups stock, stretched with 2 cups water) to a bare simmer on a back burner, I put my heavy 5-quart pot on the stove and chop half a large onion into fine—all right, fine-ish—dice, then sauté that, along with some minced garlic, in olive oil until it’s soft and translucent but not brown. Then I add 1½ cups of Arborio and stir it around until every grain is coated with oil. It should look like milk glass. A satisfying glug of white wine comes next—you’d miss that hit of acid if it weren’t there. I let that bubble away for a minute, then I start adding the hot stock, ½ cup at a time, stirring until it’s absorbed by the rice and finagling the heat to keep the liquid in the rice pot at an energetic simmer. A risotto is like a braise, in a way, because it makes its own sauce. A medium-grain rice like Arborio has lots of the starch molecules called amylopectins, which make the rice sticky. When you stir the rice, the grains release the amylopectins and thicken the liquid. Schools should require intro chemistry classes to be taught in a kitchen. Surrounded by something that smells this good, how could kids not be intrigued? Granted, risotto requires you to be on your feet and facing the stove for 20 minutes, but a glass of wine, a little dish of olives, and the culinary alchemy occurring before you make the time pass quickly. (The ability to read and stir at the same time also comes in handy.) The way I tell when I need to add more liquid is to drag a flat-edged wooden spatula—one of the most useful kitchen tools ever—through the center of the rice. If you see only a small bit of liquid, then the rice is thirsty for more. About halfway through adding the liquid, I stir in the chestnuts to hotten them up. Ten minutes later, there’s still some liquid remaining, but the rice is done—it’s creamy looking and and on the tender side of al dente. I stir in the roasted squash and ½ cup of grated Parmigiano, then cover the pot and let it sit for a few minutes. A handful of sage leaves, ripped from the pot in our sunniest corner, gets fried until crisp, which takes just seconds, and the remaining cooking liquid—just under a cup—gets added to the risotto so that it is all’ onda, or wavy. Cue sage leaves and a little more Parm, and we are in business. I really have to get better at taking photos of finished dishes, but our pasta bowls were nice and hot and risotto doesn’t like to hang about too long. So you will just have to use your imagination. I finally found that beautiful book, though. Thank you for writing! Hard to believe the chestnut sellers will be back on the streets of New York in another month….